Hallelujah! Finally! After two long weeks of killing snails, squishing green droplets, chiong-ing* pigs, whacking mushrooms and hacking tree trunks, I have finally moved up to level 25 on my warrior, Lexiena. Check out my new and blue outfit. If you�re wondering what I�m talking about, welcome to the world of Maply Story. I�m not sure what kind of online game it is but I was told by Jun Wei that it�s a MPORPG (multi-player online role playing game). It�s rather addictive, I must say. It�s a joy to kill all those snails/squishies/mushrooms/tree trunks/pigs No, I�m not stressed. Neither am I sick so kindly stop feeling my forehead! Previous Previous post: I Can�t Believe You�re Older! Next Next post: Shall We Dance, Elektra? lol, I would use WP, only problem is, I cannae remember my usernamne and password! nadine!!! 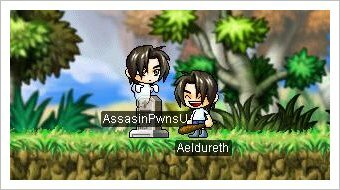 u play maplestory?! lolx, if u nid help in getting quest items, pm me okay? i�ve got a lvl54 wiz named mabelle. happy 2005! thanks. Wow, I really like your layout�its spiffy. That looks like a cute game. I am not into RPGs but that�s because I haven�t really tried �em out. I�m sure I�ll get hooked if I sit down and play them. Take care! =) *hugs* Hope you feel better about that whole �issue� you were relaying with your hiatus sign over there at the front. hehe add me in MS…my user name is Mrdeveil or is it MrDeveil…try both. Hey, I play Maple Story too. I’m briannababby – add me.